Did you read that? The Silhouette will allow you to use your own computer's fonts and doesn't require you to purchase additional expensive cartridges. And you can use a variety of materials to cut with including paper, cardstock, vinyl and even lightweight fabrics (up to about .8mm in thickness). BLACK FRIDAY PROMOTION just in time for Christmas! Many materials can be used such as paper, cardstock, lightweight fabric, vinyl, heat transfer, glass etching material, etc. Materials with a backing, such as vinyl or heat transfer material, can be cut without the mat. Replacement blades and mats are priced similar to other die cutting machines on the market. The Silhouette Blog has a lot of great project ideas and tips. Great! I hope this one will make your Christmas gift giving for friends easy and fun. My girls and I are making these for all their friends, and I love that this is a project that is easy enough for them to help with. Purchase your supplies including the paper mache' ornaments. If you can't find these, any circle, square or rectangle flat pieces of wood from the wood working aisle at craft stores can work too. 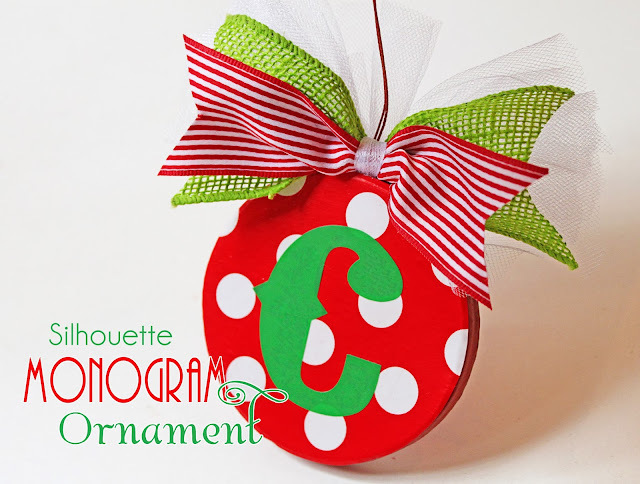 Using Mod Podge, coat the ornament on one side with the glue. Trace the ornament shape onto the back of your wrapping paper and cut out 2 circles for each ornament. (You may also use your Silhouette to make this set even easier if you don't want to trace and cut your paper yourself. NOTE: I tried this with my new Silhouette matt board and it was too sticky for the wrapping paper and I could not remove it well so I traced my shapes and cut them out). Apply cut circle to glued ornament. Press down to secure. Apply Mod Podge on top of paper to seal. Now repeat Steps 3-5 for the back side of ornament. Mod Podge dries quickly and in 10 minutes you may apply another coat to each side if you would like. Then hang ornament to dry. Using your Silhouette you can now cut out your monograms. I used the "Pointedly Mad" font from DAFONT HERE. My monograms were about 2.5" tall. I purchased vinyl from Hobby Lobby because my Silhouette brand vinyl wasn't the color I needed. I found the vinyl from Hobby Lobby needed to be applied to the matt board to run it through the machine. Peel off the monogram from the vinyl sheet. Apply the monogram to the ornament. Apply more layers of Mod Podge to seal the ornament. Cut ribbon pieces to about 6" in length. I put a striped red ribbon over a green burlap ribbon with 4 pieces of white tulle underneath. Pinch center to gather. 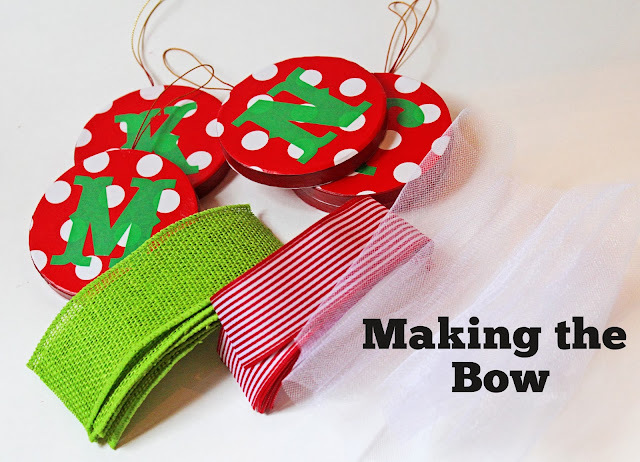 Using one of the white tulle pieces, tie a knot around all ribbons to make bow. Tie ends of white tulle around ornament hanger to attach. 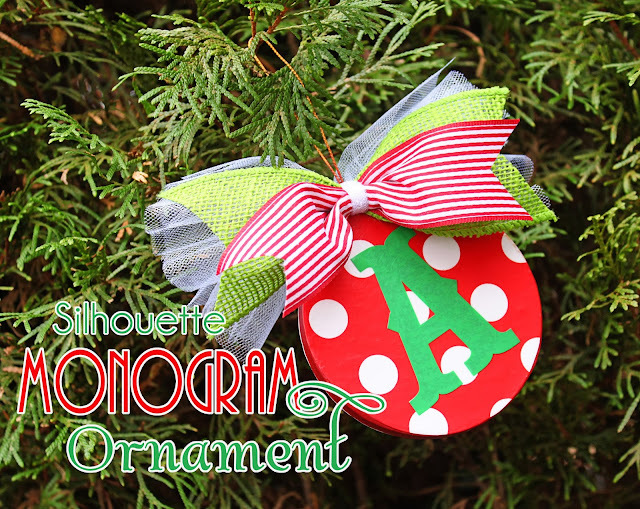 Dab some hot glue onto the top of the ornament below ribbon center to secure bow to ornament. Finish by notching ends of ribbon. Soooo easy and each ornament was made for about $1.50! Great, inexpensive, personalized gifts for all of my teenage girl's friends for Christmas. I think I'll make some for neighbors and teachers, too. So guess what? I think the Silhouette is the most versatile cutting machines on the market. I love it and it's cost effective, too. I can't wait to use it to try out even more projects for parties and gifts, too. Take advantage of this FABULOUS EVENT and order today before the SALE is over (Just remember the PROMO CODE: AMANDASPARTIES). You won't be disappointed! Be sure to check out the SILHOUETTE PINTEREST PAGE for fabulous crafting and gift ideas! *Disclaimer: I was given a Silhouette Cameo to review and create a project for my readers. All opinions are my own and no one asked me to give a positive review. Jantung bocor ialah kondisi dimana lubang pada sekar jantung akibat kelainan struktur jantung, karena sekatnya bocor maka terjadi percampuran antara darah kotor dan darah besih. Inilah yang membuat jantung tidak berfungsi secara normal.